This one will have to be a short update since I’m in the library on base, but I thought I’d put out a little more info in responce to my last blog’s comments. I have started taking pictures now that I’ve started venturing into town, but until I have a place to live, I don’t think I’ll be able to post anything. All public computers are on lockdown to anything but a CD, and all my photo stuff is designed to hook up to USB. I’m going to see if I can find a photo place in town that will make a CD (pronounced shee-dee in Japanese, no joke). Feeling a bit homesick, I went into the McDonalds today. 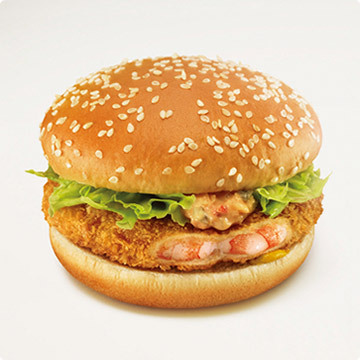 They have a shrimp burger! I think maybe next time I’ll be brave, but I chickened out today and got chicken (no pun). Posted on January 21, 2006, in A Girl in Japan. Bookmark the permalink. Leave a comment.